clubhouse taken by Roger Smith is a significant step forward for rugby in Gosport. Half of the £800,000 needed was awarded by the Lottery fund, with the rest being raised locally by the club and it's many supporters. Completion is due any time soon. 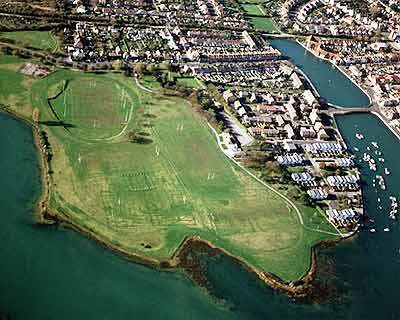 Two years ago the rugby club and Gosport Borough Council decided to apply to Sport England for a lottery grant. At the same time the club commenced a vigorous fund raising project for the development of a new clubhouse. The Club formed a Lottery Bid team of 2, Club President Martyn Webb and Chairman of the Mini/Youth section, Mick Monaghan, who together with the Council took the scheme forward. Project Leader Mick said, "Working in partnership with Gosport Council has proven invaluable in making this bid a success. It was in fact the Council's generous financial support of £175,000 that was the cornerstone of our fund raising. This together with financial support from Fareham Borough Council, who has given £25,000, Club sponsors, including a magnificent contribution of £60,000 from Ty Europe, have all made this exciting redevelopment possible." "We mustn't forget of course the Club members themselves who have been busy and continue to fundraise, to date having raised a staggering £43,000 towards the project. Without this brilliant team effort the project would not have been possible." It was the accepted practice in Babylon 4,000 years ago that for a month after the wedding, the bride's father would supply his son-in-law with all the mead he could drink. Mead is a honey beer and because their calendar was lunar based; this period was called the honey month or what was known today as the honeymoon.